They have names like Zippy, Ruthie, Chewie and Barnabas. 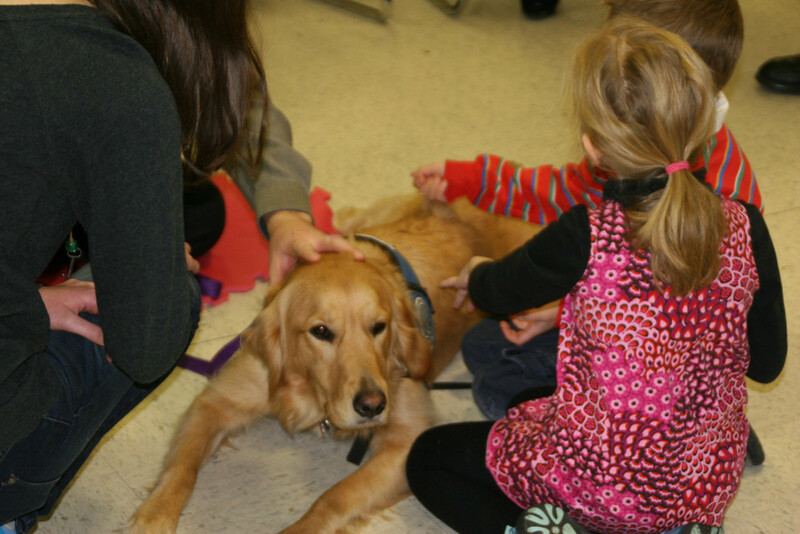 They’re a group of Golden Retrievers who came to Newtown to help ease the pain of a tragic situation and bring smiles to some children (and adults) simply by being dogs. It seems to be working. Their humans, volunteers from the Lutheran Church Charities, made the 800 mile trip from the Chicago area to Connecticut with 10 of these gentle animals whose sole purpose – their job, if you will, is to serve as a distraction for people around the country who are going through times of crisis. Since the Comfort Dog program began, in 2008, their numbers have grown from just a few to the present figure of 60 in 6 different States. 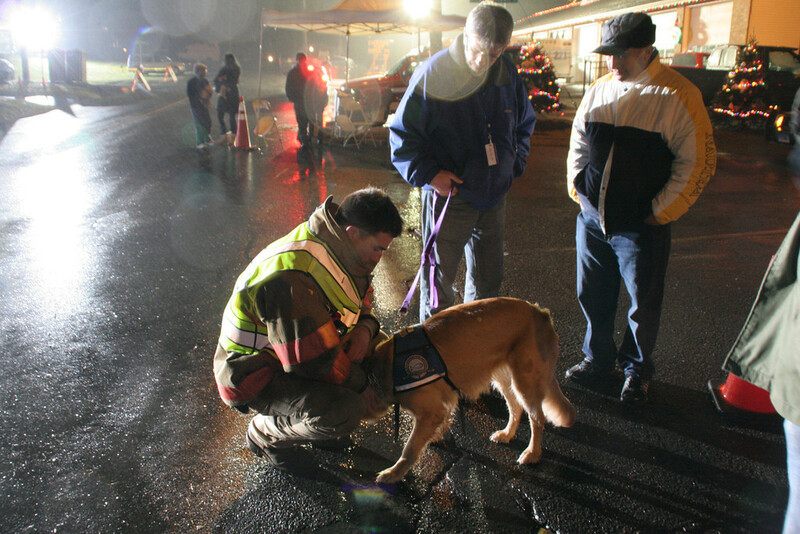 The Retrievers have traveled to New Orleans, after Hurricane Isaac, to Joplin, Missouri, in the days after the devastating tornado, and to the tri-State area following Hurricane Sandy. 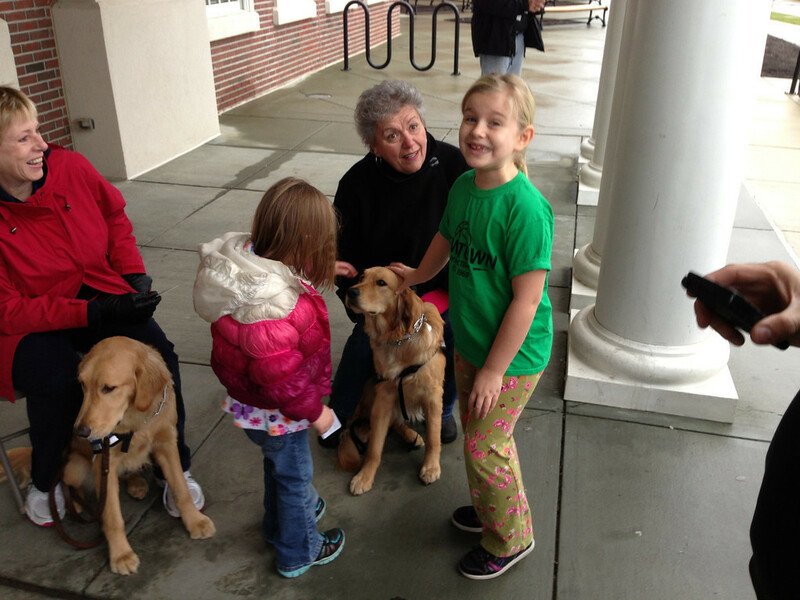 When they’re not traveling, they visit hospitals and senior centers, bringing their own very special, warm, furry hugs. Each dog carries his or her own business cards and they have their own Facebook pages and Twitter accounts for children who want to stay in touch with their new friends. I don’t need to tell you, if you love animals, how a simple pat on the head or a belly rub can help heal and comfort us when we need it the most. Pictures really do speak a thousand words. This entry was posted in In The News, Making Stall Talk, Uncategorized. Bookmark the permalink. Empress you are turning me into a dog lover!! Thanks for a nice heart warming blog!! JNNTJ, Then I must be doing something right. Dogs Rule!!! Awesome story Empress. My Mishka is also a certified therapy dog and I wish we could have joined the Goldens from the Comfort group. Btw all my Samoyeds have been therapy dogs. 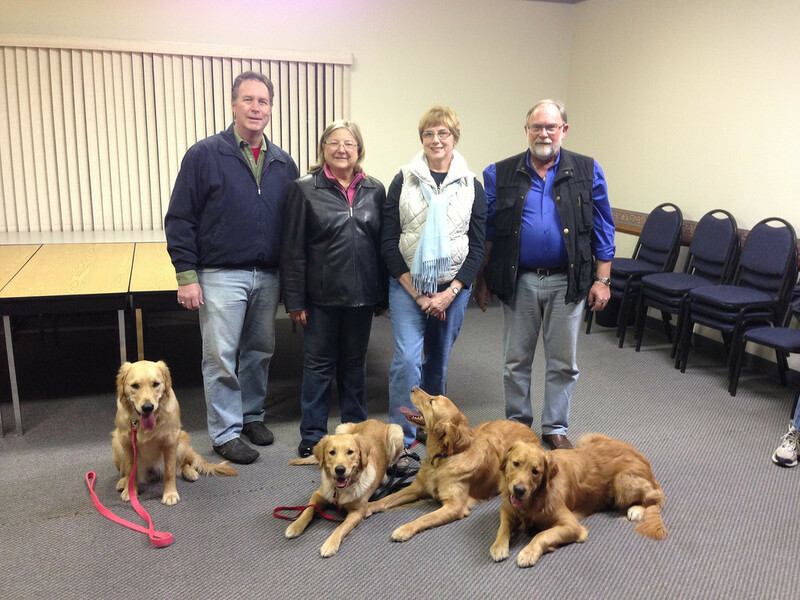 Like Golden Retreivers and so many other breeds they are naturals at doing Therapy. I don’t need to tell you, if you love animals, how a simple pat on the head or a belly rub can help heal and comfort us when we need it the most. (sorry, had to do it).. Great post Empress. Thank you. I’ll link it right now for my massive list of ‘friends’ on FB. Puppy dog tails or purry kitties are just the thing at a time like this. They are doing a segment about these beautiful dogs on The Today Show-all the dogs are sleeping!! So cute!! Wow – much laptop just decided to post this – talk about weird! 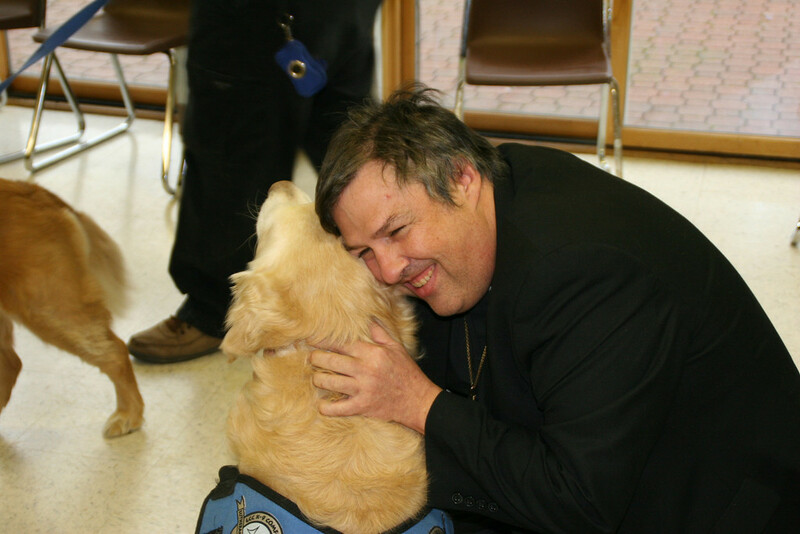 Anyway, I was just going to add that I don’t know exactly what it says – that people with profound psychiatric illnesses seem to deeply enjoy Pet Therapy – but it must demonstrate the power an animal has in helping elevate one’s mood. 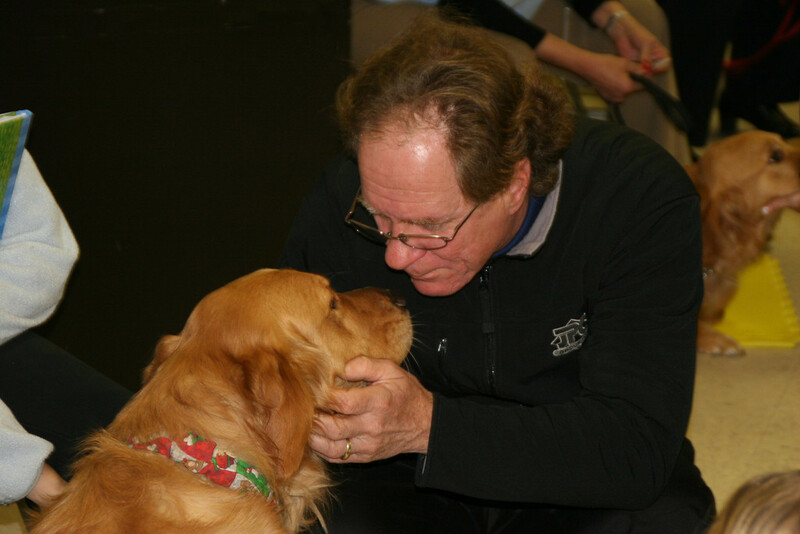 Personally speaking in regards to therapy/working dogs – my brother had a guide dog. A beautiful golden lab named T (the puppy trainer is the one that gets to name the dog and is told to name it according to whichever letter of the alphbet is next on the list. IMO, the puppy trainer was not very creative as he just called him T. It wouldn’t have been my choice – but hey, different strokes, I guess). At a certain age, they have to be retired and you have the option of keeping the dog or giving him/her back to the agency. Well, it took about 2 nanoseconds for my brother to decide that T was staying with him. My brother still lives with my folks due to his disabilites (in addition to his blindness, my bro has a TBI and a few other difficulties) and T was a huge part of our family. Sadly, the dog passed away a year ago. We still miss him. And even though my brother qualifies for another dog – he won’t do it just yet because he still misses T.
BTW and in a funny twist, staying with the topic of animals – my typos and laptop is worse than ever because my darling little 4.5 month old kitten decided to use my computer (maybe he was emailing his friend Mel?!?) and succeeded in removng several keys. I am missing the letter I and a few others are loose. What’s even more funny, is that I really think he reprogrammed my laptop somehow!!! Strange things happen when I hit certain keys now. AND my little guy somehow managed to put the magnifier on! The print was HUGE! I didn’t even know I had a magnifier. My poor baby, maybe he needs glasses. LOL! What is it with our pets and our electronics?!?! At least you never had to explain to a police dispatcher that your dog really did hit 911 on speed dial. Omg – no! He called 911??!! That had to be one funny conversation- “No really, my DOG called I swear” LOL!! Maybe he was trying to dial 411 to get a friends (Mel no doubt as he is very popular) phone number? Thats great that your dogs email. How kind of you to type for him! So your his working human? LOL!!!! Boobah, What a wonderful story to share. On an almost daily basis, I see stories about what dogs do for their humans, in all kinds of circumstances. I don’t know how or why it happens, but, I, for one, am incredibly grateful for them. Me too, Empress. I have had dogs all my life until a few yrs ago. I love black labs! Growing up, some of my best memories include my beloved black lab, Maxie. Animals are one of the better parts of life, IMO. I, too, am so grateful for them. “Animals are one of the better parts of life…” Amen and hallelujah!